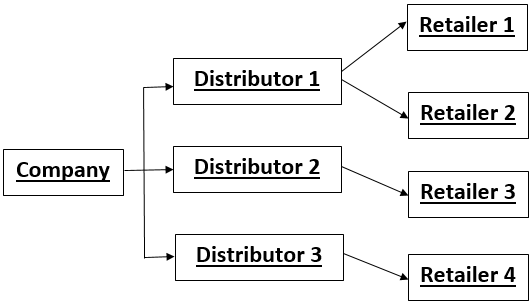 How product distribution management system works? In the above figure, there is a company which manufactures number of products and supplies it to the distributor. The distributor supplies it to the retailer and so goes the whole process. So let us take ABC as the company which has its various distributors viz., Distributor 1, Distributor 2, Distributor 3 and Distributor 4, and many more distributors. The app is given to the distributors who has his separate login id. There are two basic modules in SalesTrendz viz., salesmen tracking and product distribution management. The company supplies a bunch of manufactured products to the distributor. Say the distributor currently has 100 numbers of a product in the stock. Company supplies 20 more numbers to him. The stock present then with the distributor is 120. 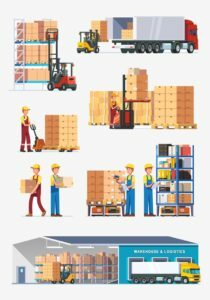 As and when the products are supplied by the distributors to the retailer, his inventory is reduced and the distributor is liable for making payment to the company and ask for new supply from company. On a single cloud software, the stock is maintained, inventory is maintained, and there is order booking and order supply, collection activity, all is happening and visible on real time basis. Suppose the distributor had 100 items already, the company supplied him 20 more adding to 120 items. The distributor’s stock is increased as many items are supplied to him by the company whereas, the company’s stock gets reduced. Now, the retailer placed an order of 5 items, the distributor supplied the order, the inventory with distributor is now 115 items. The retailer paid to the distributor. If the cost for each item is 50, total cost to be paid is Rs.250. The retailer opts for partial payment and pays Rs.200 to the distributor. Hence, the collection activity is done on the app itself. The distributor ought to pay back to the company its due. 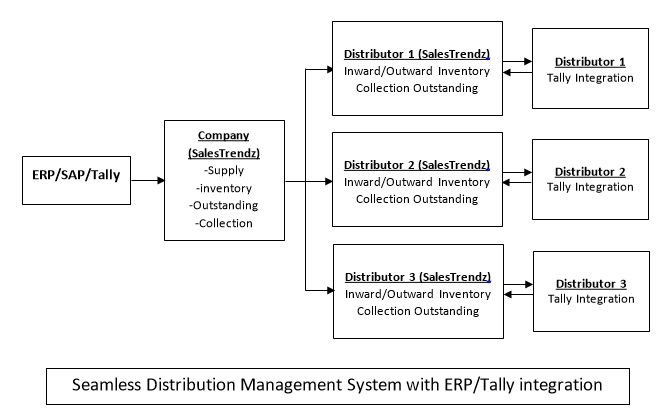 Once the goods have been sold and payment received because SalesTrendz is integrated with tally at distributor level, it eventually gets full visibility of the order execution process. The company has the full visibility of the order placed, order supplied, payment collected, inventory and stock, pending orders, etc. So, there is no scope available with distributor to give wrong data regarding unsold inventory and secondary sales. Now why is it necessary? Why knowing what is happening at distributor level is important for the company? The company wants to know what is happening with its products. These are the things that will concern the company and that is why he’d like to have a broad visibility of secondary sales at distributor level. Whether the stock supplied to the distributor has been sold? In which specific area has the product been largely sold to? Which product attracts a particular section of retailers? Which product is in demand? That will give the company an idea about the product strategy. Now coming to the collection. Once a company supplies number of products to the distributor, the distributor is liable to pay to the company. Sometimes, the distributor might fake that the products have not been sold, and he might keep the payment pending. This is a loss for the company, therefore secondary sales visibility is necessary. Once the company knows the distributor has already sold the product, it has no reason to hold the payments anymore. SalesTrendz application and software provides separate login for each distributor. The users at distributor end can login the application, look at the pending orders and supply them on the application itself. When a company raises an invoice and supplies stock to the distributors, the same is also seen by them and a GRN (goods receipt note) is generated as soon as the goods are received by the distributors. 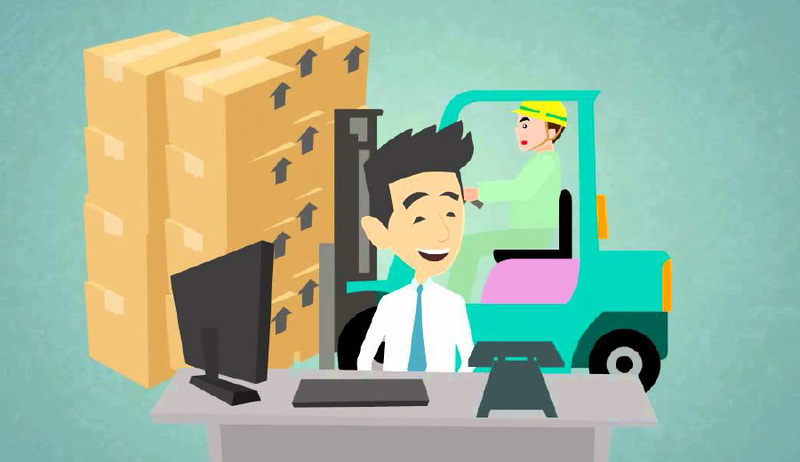 The goods received gets automatically added in the inventory of distributor and when the distributor supplies the orders his inventory gets reduced. The distributors have a tendency not to maintain sufficient inventory level as it leads to investment in product inventory. They place orders with the company only when they get orders from the retailers and customers. Due to insufficient inventory, there is always delay and loss in sales at secondary and tertiary level. By implementing SalesTrendz, the companies can have real time access to the inventory of each distributors and push more supplies as and when the inventory levels fall below the expected levels. Major concern here is that the outstanding credit for each distributor should not exceed the unsold inventory lying with him. SalesTrendz software & application maintains and shows outstanding v/s unsold inventory status for each distributor on real time basis. Why SalesTrendz for Product Distribution Management System?